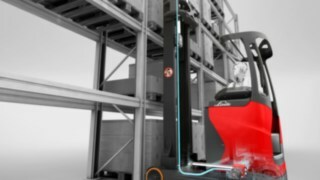 With the motto ‘zero accidents’, Linde Material Handling is pursuing a comprehensive philosophy of safety. The goal: Logistics which avoids 100 percent of accidents. With this in mind, Linde is developing technical innovations in our industrial trucks, as well as intelligent assistance systems, comprehensive training programmes, and consulting services. The result is integrated solutions which help operators to master the diverse challenges of modern, safe intralogistics. The demands placed upon modern industrial trucks and their operators are continually increasing. The trucks have to transport ever heavier loads, clear ever higher heights, and work faster, more flexibly and more efficiently. As the demands increase, so does the risk of an accident. 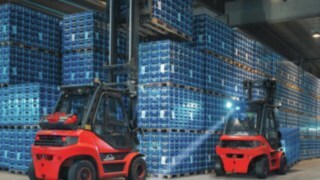 Forklifts and warehouse handling equipment from Linde therefore have numerous features as standard that increase both active and passive safety. 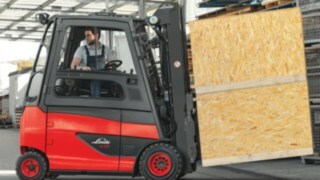 Thus, for example, the Linde Protector Frame on the Linde counterbalance forklift truck offers outstanding protection for the operator, because the operator’s protective canopy and frame form a complete, enclosed protective space. Via the overhead tilt cylinder, the truck’s load is distributed equally across its entire structure. In addition, the configuration of the tilt cylinder allows the use of slim profile lift masts. This gives the operator an optimal field of vision. In order to effectively guard against the truck tipping over in all loading and driving situations, the overall system is designed such that the centre of gravity is as far forward and as low down as possible. 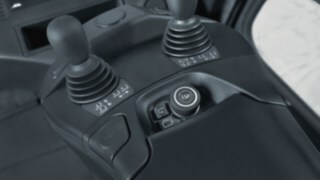 Similar design details which help to improve safety are to be found on all Linde industrial trucks. 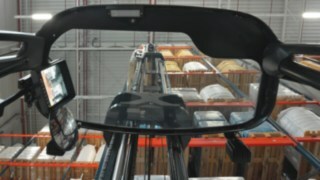 The operator’s workplace is outfitted such that the operator’s entire body stays within the contours of the truck, while at the same time allowing the user to keep an eye on their surrounding environment. Technology is not the only crucial element in safety, however. More than 90 percent of all accidents at work can be traced back to human error. And this is exactly where Linde Material Handling’s driver assistance systems come into play. They actively support the operator in keeping their working day safe. 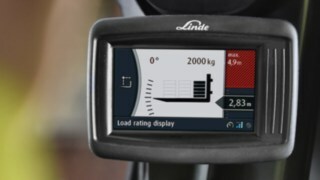 Using solutions such as Linde SpeedAssist and Linde CurveAssist, the electronics automatically adjust the power output of the engine and the maximum speed of the truck to the environment and the driving situation. The Linde Safety Pilot is a milestone in the development of safety systems. As an intelligent co-driver, the system keeps the operator informed of all the most important parameters at all times. This includes, amongst other things, the current load weight or the maximum possible lift height. But that’s not all. As soon as certain limits are reached, the Linde Safety Pilot actively intervenes and prevents operating errors. Further examples of intelligent assistance systems are developments such as Dynamic Mast Control or Linde BlueSpot. 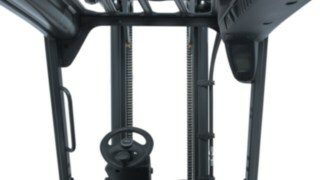 Dynamic Mast Control actively compensates for any to and fro movements of the mast on a lift truck. 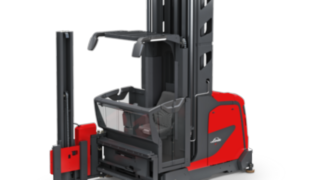 This allows forklift operators to operate precisely and safely even at maximum height and with heavy loads. 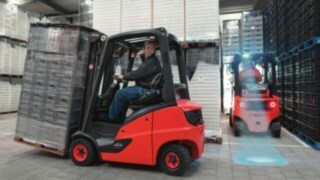 Linde BlueSpot again increases safety in areas in which people and forklifts work closely together. Well-trained operators are a deciding factor in reducing the incidence of accidents and material damage. 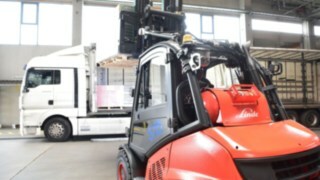 Via the Linde Academy, Linde Material Handling offers a comprehensive education and training programme for novice operators and specialists in all types of trucks. The focus here is on seminars in which specialists such as driving instructors and safety officers can offer basic and further training in both theory and practice. This helps Linde to help their customers continually improve the safety of their intralogistics. 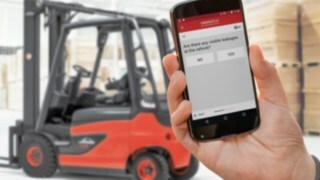 With the digital fleet management solution connect: too, Linde offers numerous functions which improve the safety of operators. 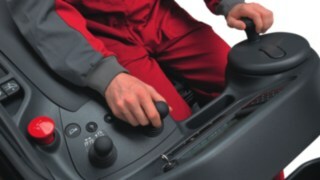 Using the personalised access controls, the operator can individually configure the truck for a particular driver. Depending on the operator’s qualifications and the intended purpose of the truck, for example, the maximum speed can be limited. In turn, when beginning work the operator can verify the condition of their truck using an app. In addition, connect: offers functions such as electronic damage monitoring, automated transmission of error codes, and analysis of usage data. The thread running through everything offered by Linde Material Handling is the ‘zero accidents’ philosophy. 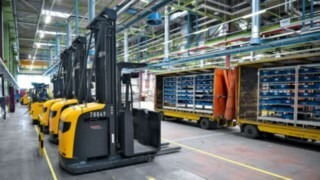 This is based on a vision of preventing 100 percent of accidents in intralogistics – through products that set new records in safety thanks to their design, service offers which enable people to optimally configure their working environments, and innovative digital solutions that help operators to continually improve their processes.